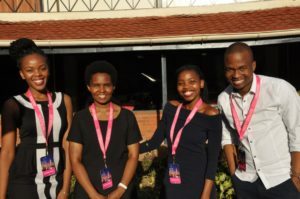 Four Rhodes University PhD Chemistry students were awarded the top position in the 2019 Hult Prize Challenge for their electronic and electronic waste management system. 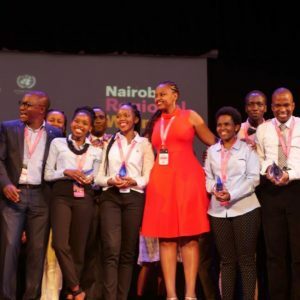 Team E-Smart, Nobuhle Ndebele (24), Lindokuhle Nene (25), Reitumetse Nkhahle (26) and Gauta Matlou (29) participated in the 2019 Hult Prize Regional Summit held at the Brookhouse International School in Nairobi, Kenya, from 19 to 20 April 2019. In its 10th year, the Hult Prize challenged innovative University and College students from across the world to a social-entrepreneurship start-up that will create more than 10 000 meaningful jobs in the next decade. The Team E-Smart business model, which aims to create job opportunities for the youth through collection of electronic and electrical waste materials and further recycling, repairing or repurposing into new market products so impressed the judges that they were awarded the top position against 45 other teams from across the world. Rhodes University was the only South African university repressing participating in the challenge. Team coach and Senior Lecturer at Rhodes Business School, Dr Tshidi Mohapeloa said she decided to help the students to understand business language, as they are scientists. “I am impressed with how they adapted and understood the business world. This is an opportunity for them to become entrepreneurs,” Mohapeloa said. Lindokuhle said they have decided to be the youth that is going to stand and create things for themselves. “We are the driving force and agents of change and improvement in our country. We want to lay a platform for generations to come after us, they must know that as a human being, you can do anything you put your mind to. Students must not limit themselves based on specific disciplines that they are doing,” said Lindokuhle. According to the Team E-Smart, South Africa annually produces about 316 thousand tons of electronic waste. Only about 12% is collected and recycled and it is exported to other countries. The team want to contribute to the economy while also promoting proudly South African goods. “The electronic waste that is currently not collected and recycled or repurposed will raise about R15 Billion for the South African economy,” added Lindokuhle. The team plans to visit schools across the country to raise awareness about electronic waste and its dangers while inspiring young people to open their minds to opportunities. Following this win, the team will spend eight weeks in the United Kingdom for the Hult-Prize Acceleration program starting on 27 July 2019. The programme aims to prepare the 25-plus winning teams from different regional summits for the final pitch competition, where the best business idea will win $1 000 000 as a start-up injection. Former Proteas fast bowler, Yusuf Abdulla has been appointed as the new coach of the Hollywoodbets KZN Inland team. The Dundee-raised left-arm speedster, who played two T20 internationals for South Africa and enjoyed a successful career with the Dolphins, and both the KZN and KZN Inland sides, takes over the reigns at the Pietermaritzburg hub from Shane Burger, who has taken up a coaching position in Scotland. 36- year -old Abdulla, whose quick, skiddy deliveries earned him the nickname “The Heater” and the “Dundee Express”. The position as coach of the KZN Inland is the start of a new chapter in his cricket career. “I am very excited!” said Abdulla, who started his ride to prominence with the KZN Inland side when it was coached by Grant Morgan, now the head coach of the Hollywoodbets Dolphins. “It is the start of a new journey in my cricketing career. It is not an easy journey as it is different from playing – you are on the side instead of being on the field – but for me, as long as I am part of it, I am enjoying it. I was in the system with Grant Morgan as a coach, and worked with Shane Burger as Inland captain and then worked as his assistant when he was coaching, so I got into a good groove with them,” he said. “It is easy to build from where they left off,” he added, stressing that he was conscious that Inland are in a rebuilding phase. “My relationship with Grant Morgan goes a long way back and I look forward to helping produce more players for the Hollywoodbets Dolphins,” said Abdulla. He added that he wanted to continue the positive impact that Morgan and Burger had in making the Pietermaritzburg Oval a vibrant cricket hub. “We have some good names in the side and there are a few others that are coming to join us this season at Inland,” he said. In welcoming Abdulla to his new role, KZN Cricket CEO Heinrich Strydom was confident he had the attributes to continue the success that Inland has enjoyed in recent years. “As a player who first made his mark here, Yusuf knows and understands the cricket culture,” said Strydom. “He is passionate and excited about developing the current Inland side into a unit that is capable of winning titles, and keeping the Inland Blues supporters coming through the gates at the Oval.We wish him all the best and will offer him all the support he needs to achieve his goals,” he added. The post Yusuf Abdulla takes over as KZN Inland coach appeared first on Tabloid Newspapers. Sydenham police station has been plunged into mourning after a constable of the Sydenham Crime Prevention Unit was shot and killed along the M19 on Sunday afternoon. 27-year-old Cst Nkanyiso Ndabenhle Biyela was shot dead in cold blood whilst on active duty. Spokesperson for the National Commissioner, Brigadier Vishnu Naidoo, said, “The member together with other colleagues were patrolling the M19 road which runs between Reservoir Hills and Pinetown. The members spotted a vehicle parked alongside the M19 with its hazards on and decided to investigate. As the constable approached the vehicle, an occupant of the vehicle shot and fatally wounded the constable. The National Commissioner of Police, General Khehla John Sitole expressed his deepest condolences to the family, relatives and friends of our fallen member. “I have also tasked the Acting Provincial Commissioner, Lieutenant General Mkhwanazi to ensure that this case be investigated thoroughly,” said General Sitole. to hospital by Rescue Care paramedics,” said Jamieson. 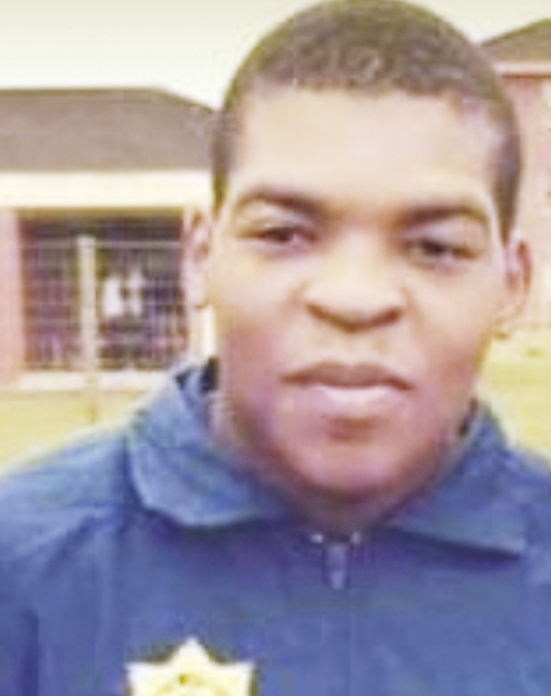 The post Sydenham constable killed on duty, suspect in custody appeared first on Tabloid Newspapers. Recently, I had the pleasure of speaking to an audience on the Wheel of Life. A simple yet powerful tool used in coaching, to help understand where you are and which areas of your particular life needs attention to create balance. This wheel consists of different spokes that represent essential parts of our lives, these parts are used to create a complete whole. By taking a honest assessment of the self, you would be able to identify exactly the aspect of your life that is thriving and on the other hand, the aspects that deserve more attention. The usual spokes that form part of the wheel are health and wellness, spirituality, career, finance, physical / environmental possessions, fun / recreation, personal development, friends / community, family and personal relationships. These spokes all carry an equal weight within our life – all scored out for 10 (with 10 being that you are most fulfilled and zero being that this aspect is poor or non-existent). It is important to be absolutely honest when completing this exercise, and to remember that this is not about the future but rather where you are at the current place within that spoke. often working on deadlines and physical exercise takes the brunt of being busy within career, and family aspects. I did rate myself a decent enough score for the spirituality spoke as I spend time every day meditating and reading from the Vedas – this assists in keeping me focused and grounded. I believed that my life was somewhat balanced. However, when completing my Wheel of Life I found that there were a good few spokes that out of sync – creating a jagged and unbalanced wheel. When I drew the wheel as I scored those spokes, the new perimeter of the circle gave me a visual idea of the rough spots in my wheel. There a drawing / image of the wheel is essential in seeing exactly how your wheel is created. Now, imagine if this wheel was that of a new car. How well would the car drive? Logic presents that a smooth and perfect wheel will be steady on the road. One that is jagged denotes a wheel that is unstable and wobbly. Surely, we all would like to score a full 10 marks per each spoke – but that is not the essence of this activity, but rather to show that balance is essential over a perfect score. In simple terms, we should be scoring an average across all spokes in order to be fulfilled and our life to be whole and complete. Soon enough, with jagged wheels, one or more areas of life is likely to suffer, even if the other aspect is thriving. This is when burn-out, unhappy relationships and poor health comes to the fore. We so often speak of balance and through this simple and honest tool one can identify exactly the areas wherein more time and attention needs to be devoted. All aspects work together, and therefore each spoke needs to be fulfilled. Every now and then reflection and honest assessment is important within our life. This will help us assess where we are at (now) and where we want to be (in future). It is indeed possible to fulfil all those spokes equally and completely, thereby creating a happy and healthy body and mind. About the columnist:Krsangi Radhe is am educator by profession, a public relations practitioner, motivational speaker and entrepreneur. She is also a neuro-linguistic programming practitioner, life coach and time line therapist. The post The Wheel of Life – a tool to making life whole appeared first on Tabloid Newspapers. An Overport mother, believed to be in her 70s, was miraculously rescued but tragically, her 24-year-old son, was crushed to death when a retaining wall collapsed on to their family home in West Road during the flash floods in the early hours of Tuesday morning. The slumbering son, identified as, Mohammed Saleh Jeewa, was in his bedroom when the wall crumbled and trapped him. Rescue Care operations director, Garrith Jamieson, said the victim was stuck under the heaps of rubble and was declared deceased at the scene, after rescue teams battled for many hours to extricate his body. According to Jamieson, the elderly mother was entrapped for two hours under rubble and was rescued amidst great difficulty as the rain pounded the emergency and rescue personnel. The aged patient was rushed to a nearby hospital for urgent medical care whilst another son was also rescued without injuries. “It was a great team effort by SAPS and Metro Police Search and Rescue Care, Durban Fire Department, Rescue Care and IPSS Medical that led to the valiant rescue of the elderly lady under such tenuous circumstances,” said Jamieson. 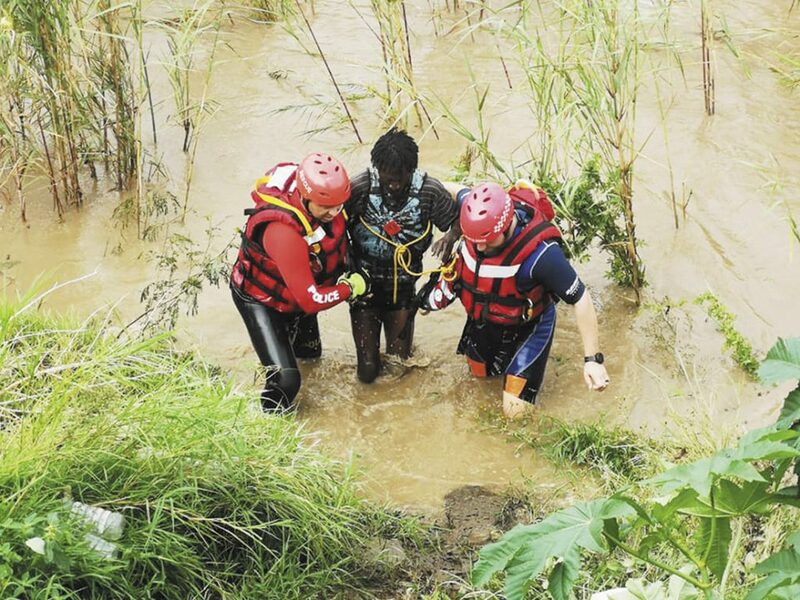 In a separate incident, a family of three from Pridley Park informal settlement and a pregnant 34-year-old woman from the Shannon Road informal settlement, were washed out about 10 metres in a landslide in the Reservoir Hills area in the early hours of Tuesday morning and their bodies were later recovered by emergency and rescue personnel. KZN EMS spokesman, Robert McKenzie, said rescuers had to crouch down to get through the small spaces between the dwellings in order to search for the bodies.Sydenham SAPS communications officer, Cpt Myen Lazarus, confirmed the deaths of the father, mother, a four-year-old child and the pregnant woman. “This is one of the worst storms that ravaged the Sydenham policing precinct. We would like to thank all the community patrollers and NGOs, who assisted in providing shelter and basic provisions for the displaced informal dwellers and with reacting to emergency call outs,” said Cpt Lazarus. The post Man crushed to death, family of three and pregnant woman killed in #DurbanFlood appeared first on Tabloid Newspapers. Trending globally, #DurbanFlood has grabbed headlines with a latest death toll of at least 51 flood victims and scores of injured and missing persons after torrential rains lashed Durban and surrounding areas from Monday night. A cloud of mourning hovers over the city as emergency and rescue workers continue to search for missing persons, whilst also unearthing bodies during their rescue missions. KwaZulu-Natal Department of Cooperative Governance and Traditional Affairs (Cogta) urged residents and visitors to the province to remain on full alert and said disaster relief efforts are in progress in all affected areas. Cogta MEC Nomusa Dube-Ncube reportedly said that as rescue operations were undertaken, more bodies were discovered under the rubble, throughout Tuesday night whilst five more people remain unaccounted for. On Tuesday, MEC Dube-Ncube, Human Settlement and Public Works MEC Ravi Pillay, eThekwini Mayor Zandile Gumede, Deputy Mayor Fawzia Peer and Exco led various assessments and relief efforts in various parts of the province. “KZN Cogta is working closely with the eThekwini Metro and other affected municipalities to ensure that all emergency relief efforts are coordinated and timeous. The authorities have also reported 145 displaced persons, some of whom have already found refuge with relatives. Those without alternative accommodation will be provided with temporary shelter as close to their homes as possible. “At the same time, we would like to assure the general public that our disaster management teams are working around the clock to attend to all reported incidents. Where help is needed, it is already on its way or will be very soon. We are overwhelmed but our presence throughout KZN ensures that we will be able to assist everywhere we are called,” said Dube-Ncube. According to eThekwini Municipality, massive damage was inflicted on public and private infrastructure. The Provincial Government of KZN, together with eThekwini Metro and all affected municipalities, had to mount a spirited response as part of efforts to alleviate the impact of these extreme weather conditions on communities and business, and to bring the lives of the people affected back to normalcy. Information from the Department of Health, said, authorities were left with no option but to source additional capacity from uMsunduzi Municipality and iLembe District. The extent of damage to infrastructure includes flooded and blocked roads, collapsed buildings and perimeter walls, blocked storm water drains and sewer lines, flooded buildings and households and power outages as a result of electric cable damage. Displaced communities have had to be temporarily accommodated in community halls where they will receive emergency relief assistance. At this stage, the focus remains on recovery and the provision of relief efforts while assessments of damages are underway. Following the catastrophic disaster, President Cyril Ramaphosa shortened his trip to the African Union (AU) summit in Egypt and returned to South Africa to visit the flood-stricken communities in KZN and the Eastern Cape. Dozens of incidents of collapsed walls and flooded homes were reported throughout Monday night, with 235 Durban homes already assessed as damaged. The assessment continues both in respect of private properties and public infrastructure. Roads have been flooded too, disrupting traffic as KZN entered the first working day after the long Easter Weekend. Meanwhile, Kwazulu-Natal Health MEC Dr Sibongiseni Dhlomo has urged the relatives of the 51 people who sadly demised during the fatal flash floods to come forward and begin the arduous task of identifying their mortal remains. At Pinetown Medico-Legal Mortuary, the mortal remains of 36 people are being kept. They were taken in from Chatsworth, Malvern, Mariannhill, and surrounding areas. The Magwaza Maphalala (Gale) Street Medico-Legal Mortuary, meanwhile, is looking after the mortal remains of 15 people who were brought in from uMlazi, Reservoir Hills, Overport, Bluff and surrounding areas. MEC Dhlomo says that the clergy, social workers will be on hand to provide counselling and other psycho-social support services for the bereaved families. “This is an extremely difficult time, but we have put these measures in place to help our fellow compatriots to cope at this difficult time,” the MEC said. 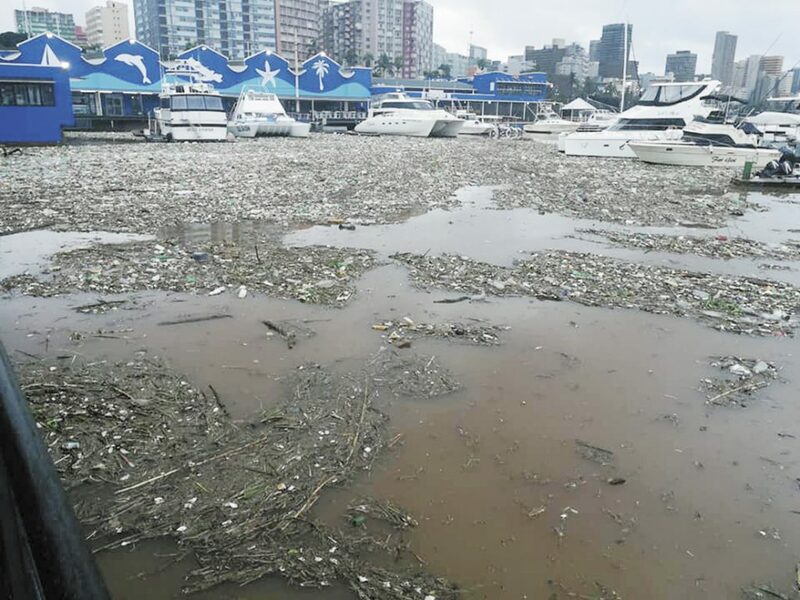 The post Death and destruction as #DurbanFlood wreaks havoc appeared first on Tabloid Newspapers. TRAC attributes the drop in road fatalities to a number of safety initiatives which were instituted to lessen the response times to roadside emergencies and incidents. Lowvelder reached 40 000 likes on Facebook and to celebrate this accolade the digital department teamed up with the HOG (Harley Owners Group) Big Five chapter, led by John Fraser, and Wimpy The Grove for a morning to remember. TRAC is pleased to announce zero fatalities on its South African section of the N4 Toll Route this Easter. Despite consistent rainfall in the past few weeks, the Department of Water and Sanitation has urged water users to still conserve water in the upcoming winter months. Here is your water and dam update. Interested in CSI agricultural projects? One of the biggest derbies in Sedru took place on Saturday afternoon at the Oval between Old Collegians (OC) and Lily White. OC retained their bragging rights and dominants over their arch rivals Lily White and it was again no different on Saturday 13 April. Klipfontein United, Eastern and Kowie United also recorded impressive victories over their opponents. Klipfontein is now the front runners and log leaders after round two. Old Collegians vs Lily White (Oval) Star flyhalf and playmaker of OC Siyabonga “Tsetse” Mahapi was the star performer for his side and was the difference between the two top sides in the end of their derby encounter. Mahapi was in sublime form and his all-round performance saw him scoop the Man of the Match Award by contributing all his side’s 23 points. As expected, the game started at great pace and intensity with both teams executing their flair with entertaining and exciting running rugby. This brutal affair saw both teams making unnecessary errors with their over-eagerness to score points. The dangerous and skilful backline of OC showed their class out wide, with Xabiso Moni at inside centre crossing the advantage line consistently with his strong storming runs. Mahapi scored two converted tries in the first half to give his side a 14-0 lead at half time. Lily Whites fought back nicely in the second half and played more like a unit. Their mobile forwards combined well and started gaining much needed momentum and territorial advantage. Mahapi slotted another penalty in the second half before Lily Whites replied with two converted tries to narrow matter at 17-14. But Mahapi’s brilliance took the game away from Blues with two further penalties deep in the second half, to secure his side a well earned 23-14 derby win. OC, who are the defending champions, are now one of the hot favourites early on in the league. Swallows vs Kowie United (Oval) A closely contested affair between the Swallows and Kowie United took place in front of a large crowd on Saturday afternoon. Kowie pipped Swallows in the dying stages of the game to clinch a hard-fought 14-17 win. Kowie produced a good first half performance by scoring two tries in the form of winger Johnny Hilpert and outside centre Angelo Frazer to take a 10-0 lead after the first 40 minutes. Swallows staged a good comeback in the second half that saw the visitor’s discipline let them down, resulting in a red card to their star prop forward Jerome Blaauw who left the field. Swallows took full advantage of this and scored two second half tries. The home side played with more confidence but it was too late in the end as Andley Jones slotted a penalty which would see Kowie gain a narrow 17-14 win. Wanderers vs Klipfontein (Mickey Yili) The Wanderers gave Klipfontein a run for their money at the Mickey Yili stadium on Saturday, forcing the visitors to earn their victory. Klipfontein came out full of confidence and remained calm to collect the maximum bonus point. The Wanderers forwards gained momentum as they launched attacks at the visitors but made a few errors on attack that prevent them from scoring more points. Klipfontein, on the other hand, played a very structured game plan and their mobile forwards and speedy backs complimented each other very well on attack, seeing them in the lead at the half time break. The second half saw the Wanderers forwards combining well together to set up a few tries, putting the visitors under pressure. However, Klipfontein’s skilful backs come to the party as they were very unpredictable on attack. Cornelius Scheepers, Deon Gunn, Rayneal Coltman, Wanda Kama, Donovan Stone and Alvarno Pullen scored tries for Klipfontein, and helped the visitors hold on at the end to claim a bonus point 34-24 win. Winter Rose vs Easterns (Mickey Yili) Easterns put up a dominant performance against the struggling Winter Rose side at the Mickey Yili Stadium on Saturday afternoon with a convincing 29-3 win. Easterns scored four tries and also earned a valuable bonus point in the end. Siyabulela Gebhuza, Sthembele Njokweni, Bulelani Maguma and Xoalni Mali scored the tries for Easterns, and piled the pressure on the Roses. In the end, Easterns proved too strong for their counterparts and were full value for the 29-3 bonus point win. The big news for the coming weeks is that Lily White will celebrate their 125th Anniversary Celebrations with an Easter Rugby Tournament from 20-22 April 2019 at the Oval. 16 Teams are expected to take part in the weekend festivities at the Oval. With Cyclone Idai fresh in our memories and KwaZulu-Natal floods still wreaking havoc, here's a reminder of flooding across the globe in recent years.